2012 Audi TT 1.8 TFSI Coupe | What Car? The Audi TT 1.8 TFSI Coupe is a new entry-level model for the range. A TT Roadster with the same 1.8-litre engine has been on sale since 2009; the new Coupe version slots in beneath the 2.0 TFSI Coupe model, undercutting it on price by 3070. Front-wheel drive and a six-speed manual gearbox are standard, while Audis S tronic seven-speed twin-clutch transmission is a 1480 option. 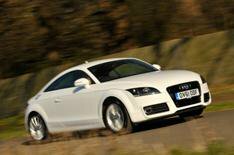 Whats the Audi TT 1.8 TFSI Coupe like to drive? Very good indeed. Engine apart, there are no technical changes compared with the brilliant TT 2.0 TFSI Coupe, which has been our Coupe of the Year for the past six years. So perhaps the real question is is it quick enough? To which the answer is yes. At 7.2 seconds, the official 0-62mph figure is 1.1 seconds down on the 2.0, but the 1.8 is far from slow. The turbocharged engine has a similar character to its larger counterpart and pulls eagerly throughout the rev range. No-ones likely to feel short-changed, or consider that this engine makes the TT a case of all show and no go. What the 1.8 doesnt provide is quite the same thrill as the 2.0. Its no hardship having to work a bit harder to achieve similar pace, but you dont get the same shove in the back when you put your foot down and the exhaust note although pleasantly rorty - doesnt have the same menacing snarl. Even so, the 1.8 is still an absolute joy to drive, with razor-sharp handling and steering that provides plenty of feel through the steering wheel. Turn-in to corners is quick and the 1.8 weighs 20kg less than the 2.0, so its just as eager to change direction. The ride is firm, but well controlled, and although theres a fair amount of road noise at speed, the TT is a decent motorway cruiser. Whats the Audi TT 1.8 TFSI Coupe like inside? From the inside, theres precious little difference between this entry-level TT and the top-of-the-range RS model that costs over 45,000. Its a beautifully-built cabin, with classy controls and top-notch materials throughout. As with any TT, theres plenty of space in the front seats, but hardly any in the back. Even a contortionist would feel cramped. The boot is a decent size and shape, and the rear seat backs fold flat to provide a surprisingly capacious load space. Yes. The 1.8 TFSI Coupe is the cheapest model in the TT range, but its also one of the best. Its brilliant to drive, has a fantastic cabin and looks as good as any other TT. As well as a list price more than 3000 lower than the 2.0s, the 1.8 sits two insurance groups lower, returns an extra 1.3mpg (at an average 43.5mpg for manual versions) and emits 152- rather than 156g/km of CO2, so itll cost less to run. This TT is also more than 1000 cheaper than a VW Golf GTI, so it represents a serious amount of fun for the money. We still think the extra sparkle of the 2.0 TFSI makes it worth its price premium, but by the slimmest of margins. If you value all the TTs other attributes above performance, we have no hesitation in recommending the 1.8 TFSI.